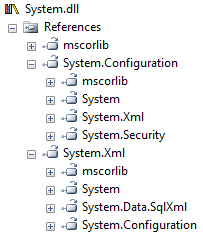 It is true in .NET that all types inherit from System.Object. What is the going on under the covers that allowed the System.Object class to allow sub-classes to be used as return types on its methods? How did this code ever compiled, as there seems to be a circular references. String <-> Object <-> Boolean. I'm sure I will see statements, on "thats how it is implemented", but I can understand if these return types were "System.Object"'s themselves, and then a sub-class used the implemenations of string, bool and other System.ValueTypes to declare a new base class. A circular reference is only an issue across multiple projects, otherwise parent/child relationship wouldn't ever exist on both sides either. Actually, it is not entirely true that all types inherit from Object. Please see Eric Lippert's blog entry on this. I dont see the problem of a base-class returning a derived class. Moreover I dont see circular dependencies since Object.ToString(); returns a String object. The String class derives from object, but so what? If both are in the same assembly, there is no problem. In addition to what others have said you can also derive a class from a base class that uses the deriving class as a generic type parameter. There are a lot of neat uses for this pattern. Not the answer you're looking for? Browse other questions tagged .net inheritance clr paradox or ask your own question.